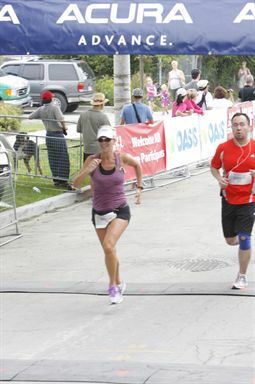 This is me crossing the finish line of the Acura 10 miler - a PR of 1:27:09. I went into the race with very little expectation after riding 90 km to Stouffville and back the day before - my longest ride ever by 40km and many many hills to boot. Happily, I awoke around 6am feeling pretty good and ready to go into the race. I had a bit of trouble getting my coffee and cereal down so was a little concerned about nutrition. I had eaten very well the 2 days prior and I was planning on popping a gel 15 minutes prior to the race so I was staying positive as I felt pretty terrific! First, a great race venue starting and ending in the distillery district. The course is beautiful as it takes you out and around the Leslie Spit with incredible views of the lake and the city. LUCKILY there was a lot of cloud cover otherwise the heat might have been unbearable - as it was it was very warm and humid making for a very sweaty run. A light rain shower might have made things better but it really wasn't that bad. We started the race in the second major corral and i think we were about a minute after the gun to cross the start line. It is a crowded race on a pretty narrow course so we came out with a quick pace - everyone trying to get settled into their own race pace - passing and being passed. From the very start my legs felt great - surprising me as i was sure they would be dead after the long ride the morning before. While I had every intention to run with my hubby, my legs were itching to pickup the pace. At the first water station I took a water and kept on going and that was the last I saw of Barry. I had planned on running with him but I knew he was planning a slower pace as his marathon is in 2 weeks and my legs just felt so good. not sure he will ever stop bugging me about saying I would run with him and then leaving him 2km into the race. I settled into a nice sub 5:30min/k averaging 5:25 over the race. I tried a new energy chew called honey Stinger Organic Energy Chews - they were tasty and seemed to do the job quite well. I popped on every water station and took water at every one. I finished the race strong at 1:27 - my first official 10 miler (I attempted the Angus Glen 10miler in the spring but it was cut short due to lightening). What a great race - the volunteers were amazing! I do however have a couple bones to pick with other racers. First, if you pack a gel (or 2 or 10) to take on the course, you can pack the wrapper up after you consume the gel. We were running out in a beautiful park in Toronto and I saw many gel packs along the course - nothing but litter. I actually reprimanded 3 runners that I witness throwing their gel packets into the grass along the route. There were many water stations with MANY trash cans - you weren't racing to get a BQ so take the second to properly discard your trash. Second, I run middle of the pack, I'm not going to win the race, I'm not going to win my age group, I'm out to have fun, test myself and be fit. Anyone racing around me must realize this as well. There is NO REASON what so ever for body checking at any time of the race. I watched one particular participate push and shove at almost every water station - seriously, by the 4th time I seriously considered tripping her! (Of course I DIDN'T). Next weekend there will be a shorter recovery between my ride and my race. I will ride 90-100k on Saturday morning and then race in the Midsummer Night's 15km on Saturday night!